Overview: Based in Southern California, Gold & Silver Inc. was established in August 2005 and is operated by the world renowned investment expert Mike Maloney. Mike Maloney is an investment expert and author of the best-selling precious metal investment book ‘Guide to Investing in Gold and Silver’. Why Choose Gold & Silver Inc? The product range includes gold and silver coins, bars, rounds, and jewelry. The gold products offered by the company include gold Buffaloes, fractional Gold Eagles, Maple Leads, Austrian Philharmonics, Krugerrands, and various other bars. In addition to this, the company also offers burglary and fire composite safes. Gold & Silver Inc. also offers segregated vault storage in safe and secured facilities worldwide. The company also delivers emergency survival food. Gold & Silver Inc.’s official website doesn’t contain a lot of information on the company’s background, mission, vision, and values. There is an entire page dedicated to the investment expert Mike Maloney, who is the founder and owner of the company. In our opinion, Gold & Silver Inc. considers the expertise and experience of Mike its unique selling point and has used it aggressively throughout its website to establish its identity as an experienced and trusted precious metals retailer. While the ‘About Us’ section does contain information on company’s mission, vision, and values, the statements made by the company in this section are too vague and unspecific. For example, ‘be available to them, ‘never betray their trust’, etc. It’s also important to mention that unlike other precious metal companies, Gold & Silver Inc. doesn’t claim to offer competitive-pricing to the customers. Click to see how Gold & Silver stacks up against the best gold companies! Gold & Silver Inc. maintains a simple yet engaging website that presents all the information in a clear and concise manner. The homepage looks like it is designed keeping in the mind the needs of serious precious metal investors. It contains recent news articles and videos, spot prices, and price charts. The website’s ‘Knowledge Center’ is well-built and contains a wealth of information for investors in the form of instructional videos, expert interviews, step-by-step guides, and news articles. The FAQs section is quite comprehensive. In addition to this, the website also offers live chat support. The website has a dedicated ‘About Us’ section but it lacks information on company’s background, trust rankings, and testimonials. Since precious metals industry is full of scams, it would be favorable for the company to add its trust rankings and customers’ reviews to encourage investors to buy precious metals from it. Gold & Silver Inc. has a strong presence on Facebook and Twitter, but unfortunately, the website doesn’t contain social sharing buttons, which means that visitors cannot share the helpful tutorial videos published on the website directly with their social networks. 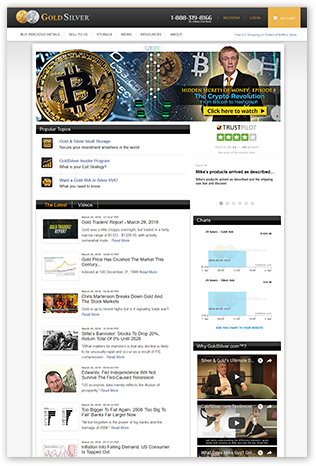 Talking about satellite websites, the homepage of the website contains an image featuring Mike Maloney with WealthCycles.com written on it. We opened the website to see it’s another website of Mike, which will be launching early in 2016. To conclude, while the product range offered by Gold & Silver Inc. is fairly limited, the educational resources and expert reviews are what make this company stand out from the competitors. Despite having a social media presence, the company doesn’t have links to Facebook and Twitter profiles on its website. In addition to this, the ‘About Us’ section is quite weak. In our opinion, these are the two potential improvement areas for Gold & Silver Inc. which, if improved, can add to the company’s customers’ base and revenue.